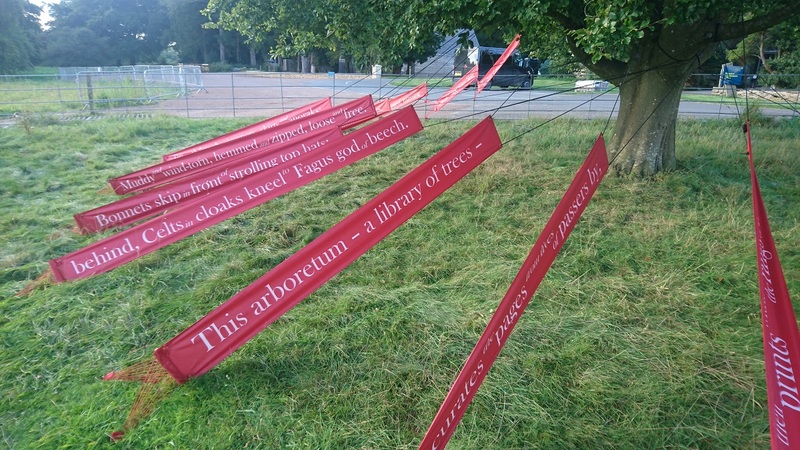 Beech Book is poem 8 on the Westonbirt Arboretum Autumn Trail 2017. I met one of the Barnett family who had adopted this tree for the family's "roots, shoots and future saplings." a sympathy of fractured stories. muddy and wind-torn, hemmed and zipped, loose and free. behind, Celts in cloaks kneel to Fagus god of beech. and in the quiet reads every line. nurtures stillness, here for us to find. This lone beech stands at the end of the Silk Wood trail. Originally, I was given the larger beech further down the hill which is both tall and wide enough to support a sonnet. I still wrote a sonnet as this is a tree I wanted to fill with words. But the banners had to be arranged in a swirl around the tree, rather than hanging vertically. The leaves of the beech turn brown in winter and are held onto for longer than other trees, sometimes not falling until early spring. The tree knows all the thoughts of people passing and each thought hangs in the paper leaves and each feeling is written on bark and into books. But when leaves fall, the thoughts seep into soil which feeds the wisdom of the tree. "Trees are sanctuaries. Whoever knows how to speak to them, whoever knows how to listen to them can learn the truth … when we are stricken and cannot bear our lives any longer, then a tree has something to say to us: Be still! Be still!" A song of what we know without knowing." nurtures Stillness, here for us to find." The beech is synonymous with writing and books. The bark of beech is smooth and pale and was used to carve on. These carvings are called 'arborglyphs'. In my poem, I had written “Behind, Celts in cloaks carve their runes in beech” but, understandably, Westonbirt thought this may encourage some modern day carvings. In Germanic societies, before the use of paper, beech wood tablets were used. The etymology of the words 'beech' and 'book' are connected. The Old English boc meant 'beech' but also meant 'book'. Today, in German, buch means 'book' and buche means 'beech'. Celts had their own symbol (from the ogham alphabet) for the beech or 'phagos' as it was known. Fagus sylvatica is the Latin for 'beech'. Druids venerate trees and for them the beech is the holder of lore, learning, ancient knowledge and tradition. They associate the holding of leaves in winter to the holding of wisdom when we reflect more in winter. Beech is associated with femininity and is known as the queen of the forest. Some beech trees can live for over one thousand years. “In the late spring/ You come out plain/ A brown paper wrapper” – Peter Bormuth, Tricolor. “Out of a book, which now you think of it/ Is one of the transformations of a tree” – Howard Nemerov, Learning the Trees. “Lengthen night and shorten day/ Every leaf speaks bliss to me” – Emily Bronte, Fall, Leaves, Fall. “These are not leaves of grass/ But leaves of Heart/ Leaves of Soul” – Bijay Kant Dubey, These Are Not Leaves of Grass. “They will not go. These leaves insist on staying” – Elizabeth Jennings, Beech. “like snowflakes falling on the Flemish clay” – Margaret Postgate Cole, The Falling Leaves. “They are a whole neighbourhood of/ Descended voices …/ Their words have been spoken/ In communion …” – Diane Shishido, The Words of Trees. “Where trees speak words/ And riverbeds are laved with gold/ … Where can all this exist?/ Here, as long as I don’t resist” – Christopher’s Dead, Where Trees Speak Words. A song of what we know without knowing.” – Jackie Kay, The Kindess of Trees. Once upon a tree: Words for writing in other languages also highlight woody links; the Latin liber (the root of library) is believed to have originally come from the word for bark. The fact that old writings survive today is often thanks to ink used to write them down. And again trees play their part; arguably gall ink made from oak galls (small plant growths caused by parasitic insects found on many species of oak) is the most important ink in Western history. Gall ink contains acidic tannins that actually bite into the paper, making the ink virtually impossible to erase. Many of our cultural treasures were written using gall ink because of this indelibility; from Da Vinci’s notebooks to music scores by Bach and drawings by Van Gogh.